Google AdSense has made it clear to all publishers advertising with them about the adjustments on their structures concerning invalid activity. They are ready to suspend anyone if they should locate any wrong or invalid activity going on any publisher account, whether old or new users. Although, this came as a warning, so all should be careful when running the affairs of Google AdSense. This time, Google AdSense team made the adjustment to look as if it were just a pet warning unlike before when you carry out invalid activity, they will just block you. But now, the punishment for invalid activity lies on suspension now. The suspension for the invalid activity was made to be 30days period, and that period no Ads would show on your blog or site. Although, it sound so fair comparing it to their former motion. 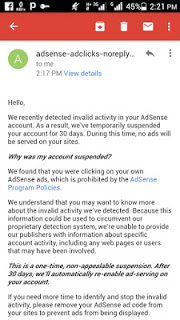 Most of Google Adsense publishers account are disabled using AdSense system without them doing anything wrong, but all they get is an automatic message from Adsense system telling them that they are disabled, trust me having seen such message, many persons give up and think the whole thing the worked for in blogging or on their site is gone. Wake up!! Your hope is not yet gone, you still have many other ways, or affiliate to run on your site in order to make cool cash. Share to let other publishers know about this.